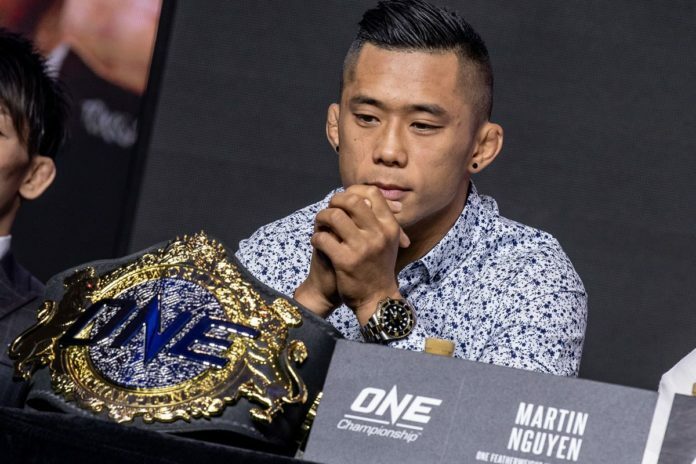 Martin Nguyen defends his ONE Featherweight title against former champion Narantungalag Jadambaa on April 12 in Manila. The contest headlines the event billed as “Roots of Honor” taking place at the Mall of Asia Arena. The official kick off press conference was held on Tuesday featuring the main and co-main event fighters, as well as the chairman of the promotion Chatri Sityodtong, who promised “a fantastic show” dedicated to “celebrate Asia’s greatest cultural treasure – martial arts”. Martin Nguyen makes his fourth appearance in Manila. Defending his strap against former champion Jadambaa he looks to “walk out of the arena still champion”. Narantungalag Jadambaa thanked the promotion for an opportunity to again challenge for the belt. He held the title in 2014 after defeating Koji Oishi. The Martin Nguyen vs. Narantungalag Jadambaa championship bout is scheduled for five rounds. The co-main event features the defending ONE Srawweight champion Yosuke Saruta up against the challenger (former champion) Joshua Pacio. The pair squares off in a rematch following their encounter early this year when Saruta took a split decision as well as the belt. The bout is also scheduled for five rounds. The full fight card for ONE: Roots of Honor can be found below. The lineup features a series of MMA, kickboxing and Muay Thai bouts.